As much as 85% of people use the internet to find local businesses. Is your business showing up as one of the first search results? Every business can benefit from having a website, but you need MORE than just a presence online -- you need a visually captivating, simple-to-understand website that is easy to update and maintain. Does your current website reflect your brand? Can you update is easily? 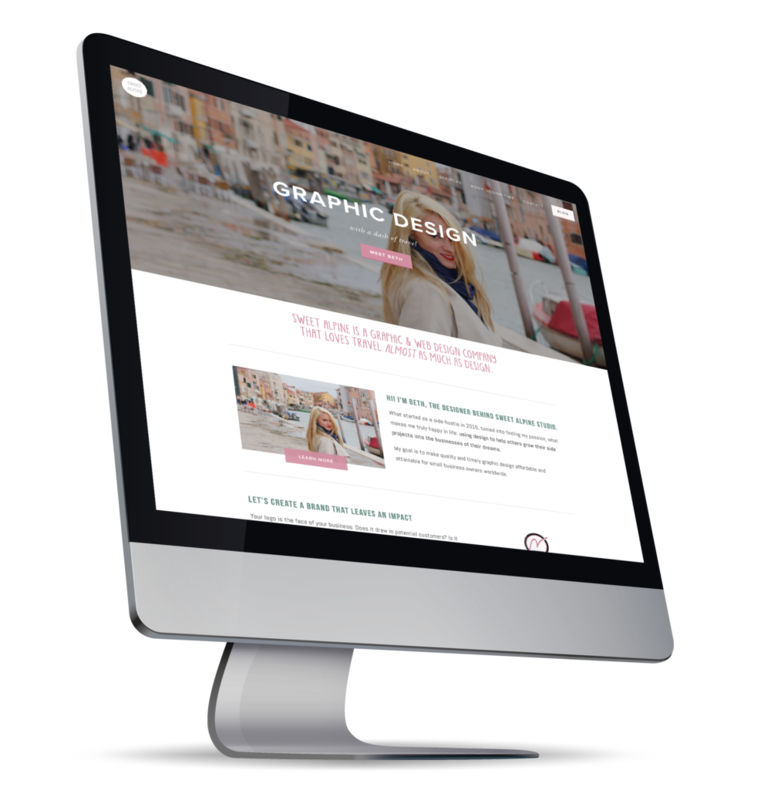 Or maybe you are just starting out and need a new website to lead potential clients your way? For many small to medium businesses, hiring a coder to build you a custom website that THEY maintain is just not in the budget. That's where we come in. Our custom websites are built on easy-to-use platforms that YOU can update in-house, on your own time - no web design experience necessary. Sweet Alpine delivers a simple, clean, and visually engaging website that YOU can edit - all in 1-2 weeks, depending on the package you select! Before we get started, check-out our simple process to get you online! Fill out our simple website worksheet + send over any photos. Design time! We create a custom website in 1-2 weeks. Review + edit your website to make sure it's exactly what you want. Before we go-live, I'll train you on how to edit your site. Pop the bubbly! It's go-live day! Every business is different. Some of us are running a one-person show. Some of us have a team of fifty, including a marketing team. How you manage your website after we deliver it should be at the top of your thought process when planning your initial (or re-branded) website design. I've been in the website industry for over ten years now and I've worked on a variety of platforms -- learning the pros and cons for each. What I've found is that small 1-3 person businesses benefit most from a custom-designed SquareSpace website. This is the easiest platform to edit if you want to update your website yourself. Let's face it: running a business is a never-ending to-do list of tasks. Let us take care of your initial website design, then seamlessly take over your own website management. Do you run a business with a marketing team or a graphic designer in-house? Or do you already have an existing website you are happy with, but just need someone to manage it? We also custom design (or manage existing websites) using Wordpress. Contact us and let's talk website design! I will help find the perfect fit for your business and budget. ALL the bells + whistles! Not seeing the right package for your business? Every business is different. We can create a custom quote for your specific business needs / budget, so you can get exactly what you're looking for from your brand new website. Contact us for a custom quote!